Weibo (WB), the Chinese social media company that has been described as the country's equivalent to Twitter (TWTR), rose on Thursday, its first day of trading after its IPO. The company raised $286 million by pricing its initial public offering of 16.8 million shares, 16% fewer than expected, at $17 a share. That price was at the low end of the expected $17 to $19 range. The stock opened at $16.27 at noon, but quickly recovered and surged more than 25% to a high of $24.48 for the day. More than 31 million shares changed hands by the close of trading. Update (4 p.m.): Updated with one-day high price information. NEW YORK (TheStreet) -- Weibo (WB - Get Report), the Chinese social media company that has been described as the country's equivalent to Twitter (TWTR - Get Report), soared on Thursday, its first day of trading after its IPO. The company raised $286 million by pricing its initial public offering of 16.8 million shares, 16% fewer than expected, at $17 a share. That price was at the low end of the expected $17 to $19 range. 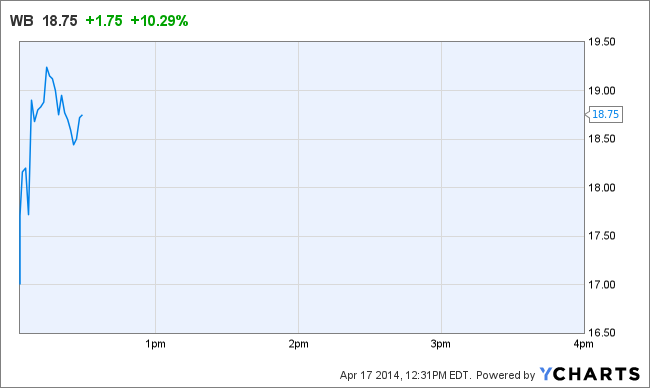 The stock opened at $16.27 at noon, but quickly recovered and surged more than 25% to a high of $24.48 for the day. More than 31 million shares changed hands by the close of trading.